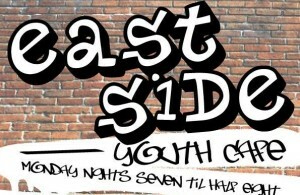 Young people in Hailsham can enjoy a wide range of activities throughout the spring and summer months at the Eastside Youth CafÃ©, which operates from the Maurice Thornton Pavilion in Orion Close on Monday evenings from 7pm to 8.30pm. Eastside is open to those aged 12 (year 8) to 16 (year 11) and adds to the existing services provided by the Town Council at the Square Youth CafÃ© in Market Square. A varied range of activities are on offer at Eastside Youth Cafe which is free to enter, provides a welcoming environment for young people to be themselves. Activities include pool, table tennis, creative crafts, games and music, skate park and play area adjacent to the youth cafe, as well as cookery sessions whereby young people can work together to cook pizza, pasta, cakes, cookies, muffins, buns and more. Additionally, a variety of outings are available to take part in at the PGL Activity Centre in Windmill Hill ranging from zip wire and giant swing to BMX biking, and raft building to archery. “Eastside Youth Cafe, like the longer established Square Youth Cafe in the town centre was born from a vision to provide local young people with a safe place to relax and socialise with friends, play games, take part in activities and enjoy some refreshments. At the moment, we have a good core group of regulars attending and the cafe has attracted a few new faces in recent months. We are keen to see them come back and bring some friends too. The Geology Of The Eastbourne And Hailsham Area: Presentation by Brian Braby. New members welcome. Annual subscription £14 (visitors £2.50 per meeting).